Someone in Wincanton has taken fly-tipping to a whole new level today, by dumping a Lexus in the drainage channel between the Morrisons roundabout and the skate park. 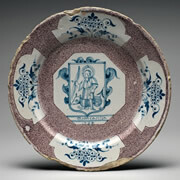 Do you have a piece of tin-glaze earthenware pottery from the Wincanton Pottery in your attic – if you have, Sarah FitzGerald would like to hear from you, because it may be a collectors’ item. 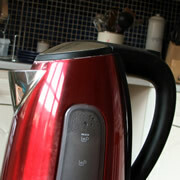 Wessex Water has asked its customers living in the Bratton Seymour, Shepton Montague, Yarlington, and Maperton areas of Somerset to boil their water before using it, as a precautionary measure after the company found the water supply was not of its usual standard. 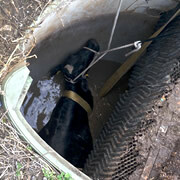 On Tuesday 21st July, a cow weighing approx 400kg fell into a domestic water treatment plant after breaking through protective fencing and was rescued with the help of Devon and Somerset Fire & Rescue Service. 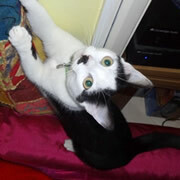 Amy is a two year-old black and white cat, missing since Monday 29th June from the Bayford area. I have leafleted the local area but would now like to appeal to the wider community. 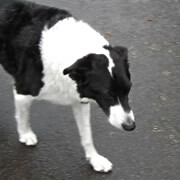 There is a reward for Amy’s safe return. 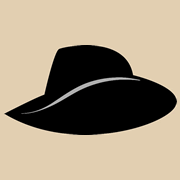 On Thursday 12th March the media announced the death of world-famous author Sir Terry Pratchett. Although Terry didn’t live in Wincanton, he most certainly had a major impact on the town. Retired local resident Frank Coffin was injured in a car accident in the Morrison’s car park on 10th December, and had to be airlifted to Royal United Hospital in Bath. 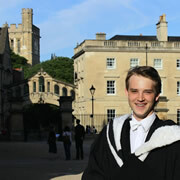 The continuing story of former King Arthur’s student, James Phillips, who studied neurosciences at Oxford University. James has since been recognised by Oxford for his outstanding academic achievements and is about to embark on four years of research in Virginia, U.S.A. 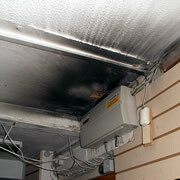 Residents and visitors to Wincanton Post Office were taken aback on Monday 7th July to find it closed after a fuse box on the premises overheated and burst into flames. This is the true story about a very lucky border collie and a Good Samaritan who rescued him from a sticky situation, proving that kindness is a thriving commodity in our community. The Secretary of State for Culture, Media and Sport, the Rt. Hon Maria Miller, recently visited Pevlings Farm, a Riding for the Disabled facility in North Cheriton, near Templecombe. Christmas Day in Wincanton Workhouse. It was a bleak time, especially for children and in the early years of its existence. For the inmates it was hard to tell Christmas Day from any other day. An interesting story of Wincanton's history. The boots of Trevor Antill, the creator of the Monarch's Way, have arrived in Wincanton after covering over two thirds of their final journey in dedication to Trevor's memory. 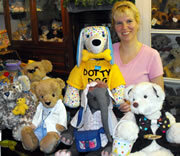 Enjoy a Day Trip to the beautiful New Forest including entry to the Autumn Hampshire Teddy Bear Fair on 20th October 2013. This trip is being organized by South West Coaches with pick-up points in Wincanton, Yeovil and surrounding areas. 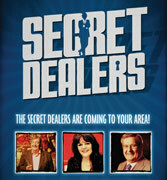 Would You Like to Appear on ITV1's Secret Dealers? ITV1's Secret Dealers is starting production on its fourth series and is looking to film in Somerset. If you have a passion for collecting antiques and would like to appear on the programme please get in touch! A Diamond Jubilee is quite an event and not just for the Queen. 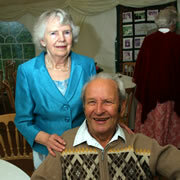 Jeff Kingaby, for years the tireless Secretary of Wincanton Museum, and his wife Molly are celebrating their Diamond wedding anniversary. Each time our firemen go out they put their lives on the line to save others. In my book they all deserve a medal. And that's exactly what they’re getting! But who are they all and what do they do? Our two baby guinea pigs were stolen from their hutch in Balsam Fields on Sunday night. Barely four weeks old, they aren't yet old enough to be away from their mum. One baby is on antibiotics so even more at risk. The BBC Somerset outside broadcast bus has come to Wincanton! 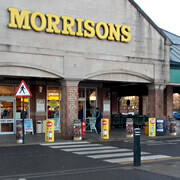 They will be broadcasting live from Morison's car park between 9.00am and 12.00pm.